CHAENG Industrial Solutions is one of the few full-range suppliers for the cement industry – from individual machines, all the way up to complete plants. We also have compelling solutions for the modernisation of existing systems. We have unique expertise in the field of process engineering. In accordance with customer-specific requirements, we develop innovative machinery, technologies and processes to create intelligent production lines. From the planning process, to construction, to the commissioning of plants, our clients have a single contact person. This accelerates procedures, prevents conflicts of interests, and ensures fast and trouble-free commissioning. The trend in the global cement industry is moving towards the awarding of turnkey orders: from individual grinding plants to entire production lines. Thanks to the application of ultra-modern production processes, our plants protect resources and the environment and guarantee plant owners maximum productivity and economy of operation. The raw materials nowadays used in the cement industry have a very broad range of properties. In particular, the limestone deposits that are the source of the main raw material show great variations in the hardness, abrasiveness and stickiness of the rock. To optimise not only the crushing process, but also the investment and operating costs, a range of different crusher types is available. To enable a qualified selection of the ideal system, proper account must be taken of the raw material properties, such as the hardness of the crusher feed rock, the abrasiveness and the degree of stickiness, the required crushed rock particle size, the capital cost and the maintenance requirement. Further important considerations for selection of the most suitable crusher system are whether it should be a mobile, semi-mobile or stationary crushing plant. 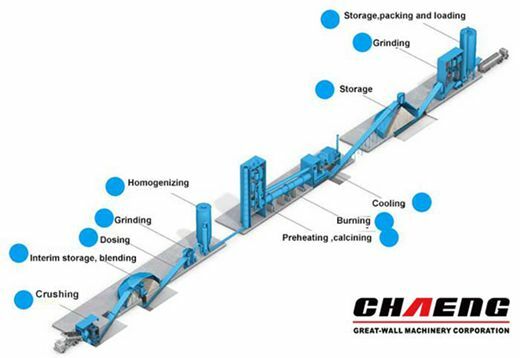 CHAENG Industrial Solutions provides the best solution for every crusher requirement. The circular blending bed is used for storage and homogenisation of the main components such as limestone, limestone/marl/clay mixtures, clay or coal. In the circular blending bed, material can be stored and reclaimed simultaneously. Here, high stacking capacities of 2500 t/h and high reclaiming capacities of up to 1500 t/h can be achieved in the case of large circular blending beds. A high blending and homogenisation effect can be achieved thanks to continuous stacking using the CHEVCON method. If only a low blending effect is required, the CONESHELL stacking method can be used. The AEROPOL is used for vertical conveyance of raw meal, cement and other fluidisable materials. This pneumatic vertical conveyor is characterised by robust operation and lower capital cost than bucket elevators. It can handle conveying capacities of up to 1000 tph over conveying heights of more than 100 m.
Grinding raw material with high moisture content our QUADROPOL mill concept QMR² is the best solution. The system has a rating of 7,000 kilowatt and a capacity of more than 600 tonnes per hour. The tangential blending silo is used for storing and homogenising the raw meal. It consists of the silo shell, the distributing system, the inner cone, the aeration surface with the discharge systems, the central mixing chamber, the aeration system and the dust collection filter. Feeding of raw meal into the silo is carried out via the distributing system. In comparison with the conventional blending silo, the number of feed arms is greater, and there is a central feed point. Feed points (external or central) that are activated alternately by means of a control system are designed to avoid the accumulation, in certain areas, of coarser raw-meal grain fractions that fall straight down. Thus, even during the filling process, segregation of the raw meal is counteracted. The tangential blending silo stands out due to its unique aeration floor that covers almost the entire ring area, thus ensuring optimum aeration of the raw material. The material can be fluidised and discharged at all points in the silo floor area. The aeration floor has a modular and compact design. Assembly is easy, safe and therefore cost-effective. The raw meal discharged from different sectors of the tangential blending silo is homogenised again in the downstream mixing chamber. The mixing chamber stands on load cells, which means that the downstream kiln feed dosing system can also be calibrated. No additional calibration container is necessary. In the case of the cement industry, today's requirement profile for the manufacturing process is directed at high production capacities with low operating and capital expenditure. For this reason, multistage cyclone preheaters with integral calciner and tertiary air duct are indispensable components of modern kiln lines. If the length to diameter ratio exceeds 15, it is best to support the rotary kiln on three roller stations. Variable-speed electromechanical drive systems with planetary gearbox, splined tyres, pneumatic inlet and outlet seals, air-cooled inlet trough, hydraulic axial thrust system etc. are proven components of both the 2-support kiln and the 3-support kiln. As the classical alternative to the splined kiln tyre, CHAENG Industrial Solutions offers the floating tyre, which is only fixed on the kiln shell in the direction of the kiln axis, so that it can turn in peripheral direction relatively to the kiln shell. The POLYTRACK cooler is a combination of a static, horizontal aeration floor and an above-floor material transport system. Moreover, the POLYTRACK tolerates fluctuations in the kiln process; its flexible and high-performance material transportation system copes with even the most difficult operating conditions. These features make the POLYTRACK an ideal solution for both new plants and conversion projects. This highly complex list of requirements is exactly fulfilled by the advantages reliably provided by the POLYTRACK cooler. Its numerous innovative process and design details make POLYTRACK a future-oriented mechanical and process technological solution. The clinker store is the source of supply for the cement grinding process. For grinding binding agents our QUADROPOL mill concept vertical roller mill is one application. Highest process-technological flexibility, energy efficiency and maximum throughput are the advantages of the mill. The vertical roller mill based on a modular concept of 3,4 or 6 rollers. Two alternative drive systems are available, the classic table drive and the innovative option with roller drive. The largest QUADROPOL is installed in Mexico. The system has a rating of 4 x 1,800 kilowatt roller drive system and a capacity up to 300 tonnes per hour. The cement can be packed in bags and palletised, loaded into "Big Bags" or transported in bulk by truck, train or ship. Individually customised solutions are incorporated into the plant concept under consideration of the layout requirements and particular national standards and rules.